The official public beta of iOS 9 was released recently, and surprisingly enough, it’s really stable. So stable that it’s as if Apple decided to launch the full version of iOS 9 early. Of course it’s got it’s share of bugs here and there, but that shouldn’t shock you considering you would have pre-release software. But that shouldn’t stop you from installing the beta, especially if you have an iPad. Apple has (finally!) optimized their mobile OS to fit the iPad’s size and capabilities. They’ve introduced new features that are exclusive for iPad customers and even more features exclusive to iPad Air 2 customers. Believe me when I tell you, as soon as you try these features out, you’ll say “Well, it’s about time!”. 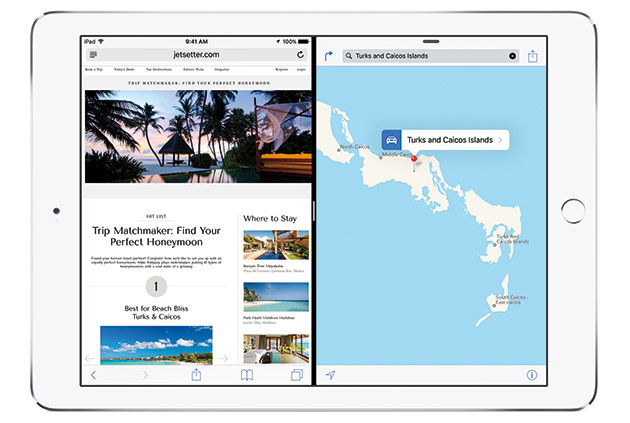 By now you should be convinced that you NEED to have iOS 9 on your iPad, but if your not, here’s 5 more reasons to test drive Apple’s next update. A lot of Android tablets (and even phones) have the ability to run 2 different apps at once. 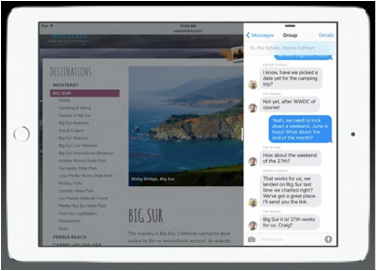 And now that feature is brought to your iPad Air 2 in iOS 9. Now, you can select 2 apps (for now, just Apple’s built-in apps) to run on your screen, resize them, and use them simultaneously. This is extremely useful if your composing an email and you need information off of a website to insert into that email. Or say your iMessaging someone and they need directions from Maps to get to the coffee shop. Of course these are just examples to give you an idea of what this feature will be like. 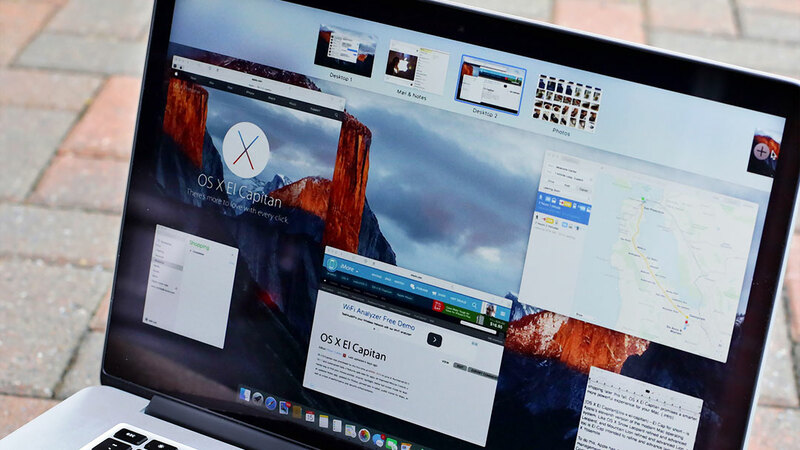 In the near future, app developers will optimize their apps for split-screen multitasking, which will most likely appear this fall with the launch of the full version of iOS 9. Let’s say you’re watching a video on YouTube and you need to write an email but you don’t wanna pause the video. 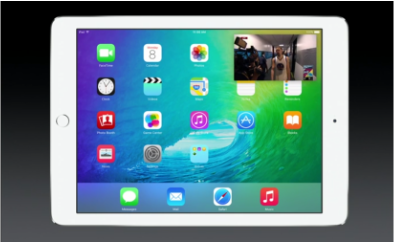 Well now in iOS 9 you can bring the video player with you wherever you go on your iPad. Whether it’s Home, another app, or Settings, the player will be floating on the screen. You can move it, resize it, or just swipe it off of the screen completely. It’s a great and welcomed addition to the iPad. This feature is unique to the iPad running iOS 9: say your doing research on Safari and you need to jot down a quick note while you don’t want Notes taking up half of your screen. Well now in iOS 9, if you slide your finger in from the right side, you’ll bring up Slide Over (which only supports Apple’s built-in apps for now) which appears like a menu: you scroll through the app choices, find Notes (or any other app), and tap on it. This way only about 1/5 of your screen is taken up by the app. Once your done in your Slide Over app, just swipe away the app to the right and it disappears. This feature is great because it solves the problem of having to go back to the home screen and choosing another app to open then going back to the previous one. A huge time saver on my part. 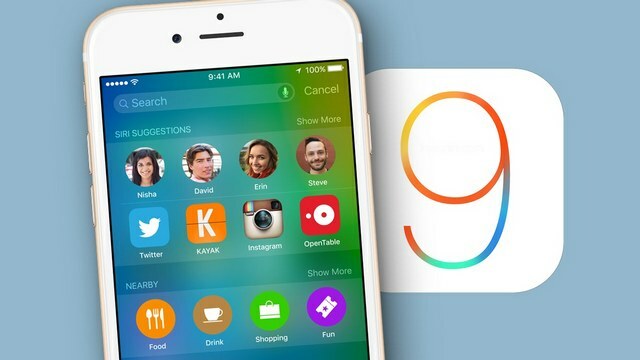 Until you begin to use iOS 9 you most likely don’t know about this feature. Sitting left and right of the QuickType predictions on the keyboard are shortcuts that will save you effort like Cut-Copy-&-Paste. Depending on which app you’re using, the shortcuts on the keyboard can differ. But nonetheless this is another great feature exclusive to the iPad in iOS 9 that users can (and should) take advantage of now. Yes, you read correctly. Apple has added a hidden trackpad to their keyboard in iOS 9. If you hold down 2 fingers on the keyboard, the keyboard will become a trackpad you can use to select text and navigate throughout a document. Now, before you get your hopes up, Apple didn’t include a fully functional trackpad like on the MacBook, but if you’re someone who spends a lot of time working on documents on your iPad then you’ll love this new addition. With all these new features that will enhance the way you use your iPad, I highly suggest you sign up for Apple’s public beta program and download iOS 9 for your iPad. So if you’re as excited about iOS 9 for iPad as I am then go ahead and visit www.beta.apple.com, sign up for their public beta program, register your iPad, and begin the installation process. But if you’re afraid of installing pre-release software on your main iPad, just wait until the full version comes out in the fall. But since Apple is giving you early access to their latest and greatest, I say take advantage of it.